Every year, "Belly" (short of Isabel) has spent the summer at the beach with her Mom, brother Steven, her Mom's friend Susannah, and Susannah's two sons Conrad and Jeremiah. And each year, Belly has nurtured a crush on Conrad, even though the boys have never shown much interest in her. But now that she is 16, something seems different. For the first time, she's no longer interested and she's certain that she's outgrown Conrad. So, why does it feel funny when she meets a new boy and starts spending time with him? And why does Conrad seem so distant and sullen? Is it jealousy or is something else going on? 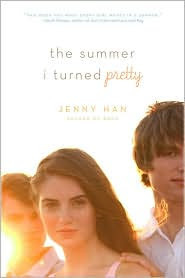 At first, this novel felt like it was just a light summer romance (albeit a well-written summer romance) with a healthy dose of flashbacks and some better-than average character development. But, by the end, Han has woven a lot more into the story, creating a far more complex romance than you might expect. Han's first novel (Shug) was funny and original. Her second outing shows that it was not a fluke.